Statistics have shown that in the first six months this year alone, 35,888 vehicles were stolen, leading to RM357 million ringgit in losses. 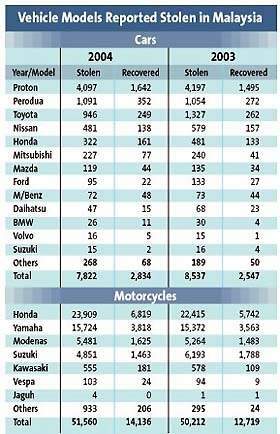 The number is broken down to motorcycles – 26096 cases, cars – 4756 cases, and vans/lorries – 3036 cases. 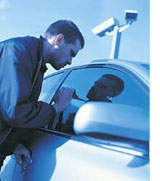 Vehicle theft contributes 45% – almost half of the countries overall crime index for the first half of this year. This was an increase from 41% for last year. On average, it takes a carjacker 3 minutes to steal your car, and within the next half an hour it could be already stripped and sold for spare parts or shipped out of the country as far as South Africa. A stolen car is driven to a warehouse where it is sprayed a new layer of paint, and chassis and registration numbers are altered if it is decided to be shipped out of the country to be sold. Vehicles stolen near the borders like Johor are usually driven out of the country immediately after the preparation and efforts by the police to recover the vehicles are unsuccessful due to lack of cooperation by the neighbouring countries. Just walk into any second hand dealership in Batam, Indonesia and you can find Proton Perdana V6 or Proton Wajas sold for half the price. A Perdana V6 can be bought for about RM31,500 and a Waja 1.6 (A) for RM27,000. The cars can also be rented for about RM100 a day. A local mechanic Attan, 30 revealed the situation. He said many of the cars in Batam were smuggled ones. â€œI do not have many customers with Proton cars, which tend to break down easily, especially on our roads which are full of potholes.” Ouch. I suppose Proton bashers would love that statement. Click here for more. Next Post: SEAT in hot soup?